Think of cat paws as the equivalent of a Swiss army knife. They are padded for silent stalking, cleated shoes for climbing heights, deadly snares for catching prey or toys, razor-tipped weapons for defense, facecloths for cleaning, and are sensing devices. The paw has special features that exist because they promote feline survival. The design allows cats to move quietly to advance on prey. The cat is light in weight and it walks on its "tippy toes" (digitigrade). 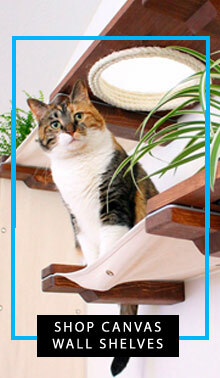 A digitigrade stance increases your cat's speed because it lengthens its stride and its footfalls are quieter. 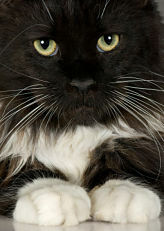 On the cat paw sole are tufts of fur and pads that cushion every step. A cat's claws retract so they don't click across a hard surface. 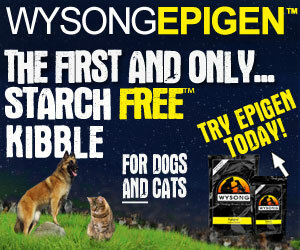 These concealed weapons help with your cat's safety and survival, especially outdoors. Sharp, retractile claws are the feline paw's most useful feature. When a cat feels threatened, it can extend its claws and scramble up the nearest tall object. Cats rely on their claws to defend themselves and catch prey. 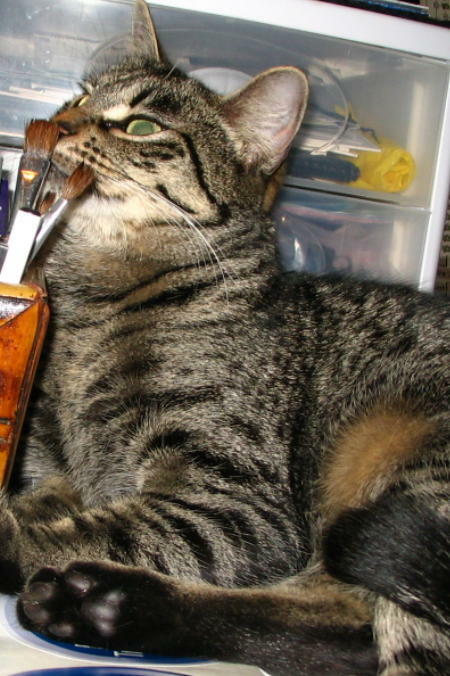 Most of the time, cats keep their claws hidden to keep the tips sharp. Retraction also keeps the claw tips from getting caught on things. 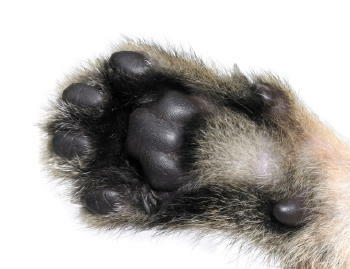 A cat's claws grow from the end of the last toe bone (distal phalanx) on each toe. The claw's normal position is retracted...held in place by a dorsal elastic ligament on each side of the toe bone. When a cat chooses to extend its claws, it contracts its deep digital flexor muscles. Tendons connected to these muscles pull the toe bones down...pushing the claws out. Tendons connected to extensor muscles hold the toe bones steady. Also, the cat's pad is the only part of the cat's body that has atrichial sweat glands for cooling. Cats sweat most often when hot, but they also get damp paws when nervous. When cats climb, they demonstrate another feature of the paw...flexibility. A cat paw can turn inward (supination). If a cat is trying to go up something round, it needs to be able to turn its paws inward to sink its claws in. A cat can knock a fluttering moth out of the air with one swipe of its flexible paw. A cat also uses the flexible ability to wash behind its ears. The cushion pads (tori) on the soles of your cat's feet are composed of thick skin, connective tissue, and fat (adipose tissue). Pads are not just shock absorbers for the feet but are finely tuned sensory organs. Countless nerves within the pads detect pressure, temperature, and pain. Because of cat paw sensitivity, most cats don't like having their feet rubbed. Cats detect variations in texture and temperature of surfaces and this helps maintain their balance over irregular ground. Paw pads and carpal whisker tufts on the back of the front paws also supply information about the movements of captured prey. Some researchers believe the pressure sensitive receptors (Pacinian corpuscles) in a cats paws are so sensitive they can detect tiny vibrations in the ground caused by moving rodents. Cats also use their paws to talk. When they scratch a cat post, a tree or furniture...it leaves behind a visible claw mark and a scent from its paw pads that tells other cats in the area...that they were there. A gently kneading paw means your chum is feeling comfy and secure. A paw with unsheathed claws is a warning that it is overexcited, fearful or feeling aggressive. A paw that repeatedly slaps your cheek in the morning means they want you to wake up and feed them. Cat paws with a pad shown by Coty.